While souvenir buildings are made of many different materials, a few have been produced in precious metals including silver. 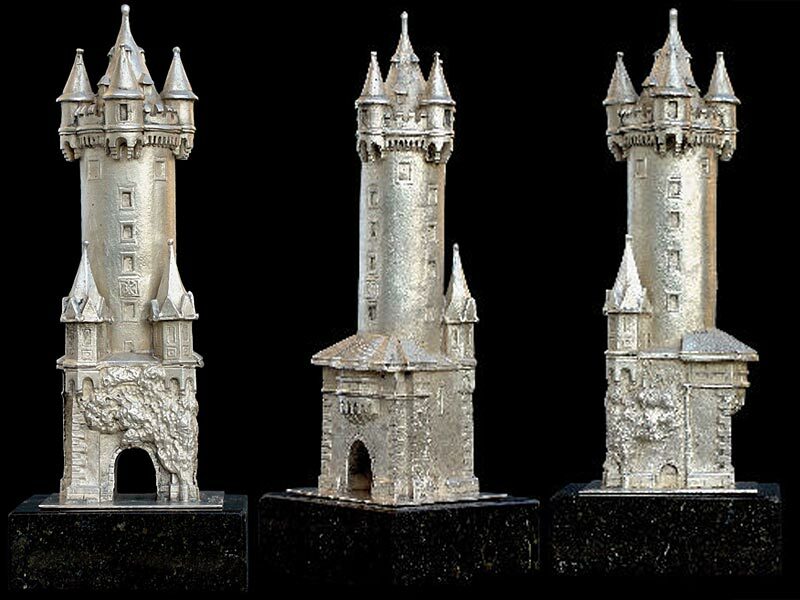 An exceptional silver building replica of the medieval city gate tower named Eschenheimer Tower recently sold on eBay. After 29 bids, it realized a price of $2,247. The exquisite work of master silversmith, Lazarus Posen, is from circa 1930 and most likely one-of-a-kind. The miniature measures with base: 6” H x 2.5” square. The firm Lazarus Posen was founded in Frankfurt on the Main in 1869, in 1938 the company was forcefully closed and looted on Kristallnacht or Night of Broken Glass. Silver hallmarks: 800 Crescent Moon, Crown, P in shield and POSEN. Weight silver (without marble base): 217 gr - 6.97671 oz (troy) - 0.48 Lbs Pounds. The real Eschenheimer Turm was built in Frankfurt, Germany in was built in 1428 by master builder Madern Gerthener and architect of the Kaiserdom. The tower was once one of about 60 towers encircling the city. Most were demolished between 1806 and 1812 when the old city walls were torn down. The Eschenheimer turm was saved from demolition thanks to the intervention of French ambassador Count d'Hédouville. Today the tower is one of Frankfurt's most famous landmarks. Originally used as a gate, the tower today has heavy traffic flows around it. Since 1992, you can again reach the Eschenheimer Turm by walking from the pedestrian-only Schillerstrasse, before you could only reach it via the subway station. 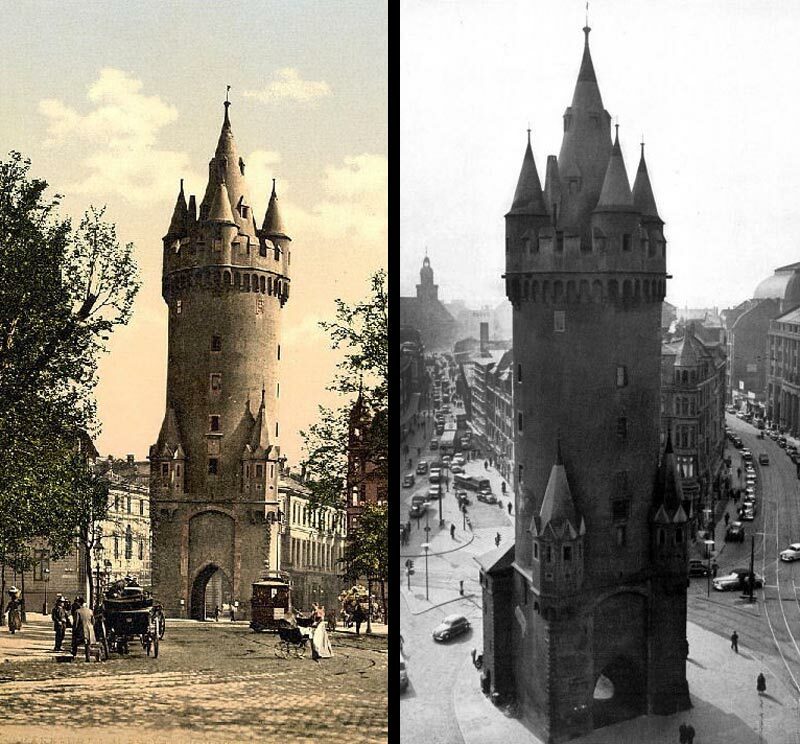 That same year a café opened at the base of the Tower. 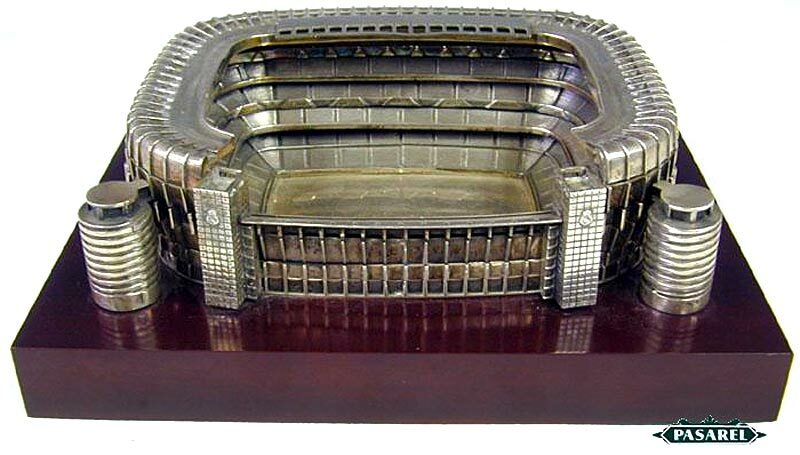 Another rare sterling silver building model is replica of a soccer football stadium, The Santiago Bernabeu in Madrid, Spain. Produced in the 1980's, this building replica has been on eBay for a buy-it-now price of $7000 for a long time. The artisan handmade model is set on a dark red wood base. The stadium is the home to the football clubs in the world, Real Madrid, which officially adapted the present name, Estadio Santiago Bernabeu on January 4th, 1955 in honor of the club president Santiago Bernabeu. The real stadium has hosted the European Cup Final on 3 separate occasions - 1957, 1969 & 1980. 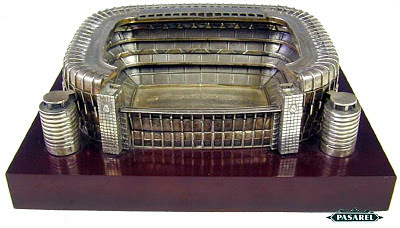 The finals for the 1964 European Nations Cup and the 1982 World Cup have also been held at the Bernabeu. This model was made before a new cover for the Padre Damian side was put in place. Marked 925 for sterling silver and maker's mark. Measures: 10.63in X 12.2 and a height of 3.94in. Weight: 159oz. Net silver weight: 3380gr / 108.67oz.